Our beautiful jewelry sets, earrings and bracelets will dazzle at your wedding, prom or quinceanera. With our wide selection of jewelry styles, colors and elements, you are sure to find the perfect complement to your gown. 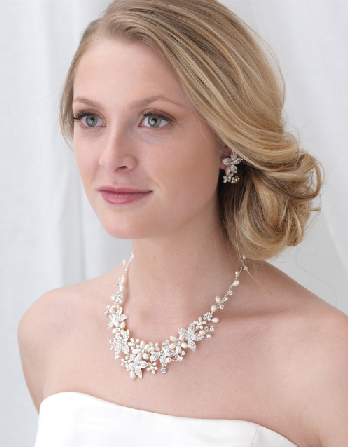 Whether you are looking for an understated look or a dramatic statement piece, you are sure to find it at Affordable Elegance Bridal. Featured here is our beautiful pearl and crystal jewelry set ne1670S. Need help finding the best jewelry for your ensemble? Call or email us and we'll be happy to help!